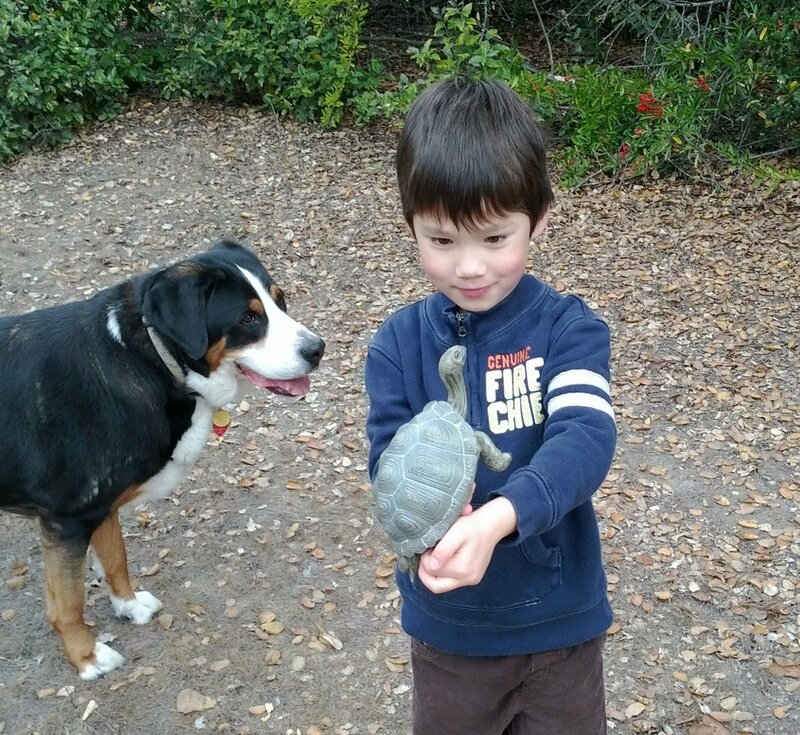 First thing in the morning, my oldest son exclaims he wants to go for a walk in the woods so he can find a turtle. No wait. So he can find 3 turtles. 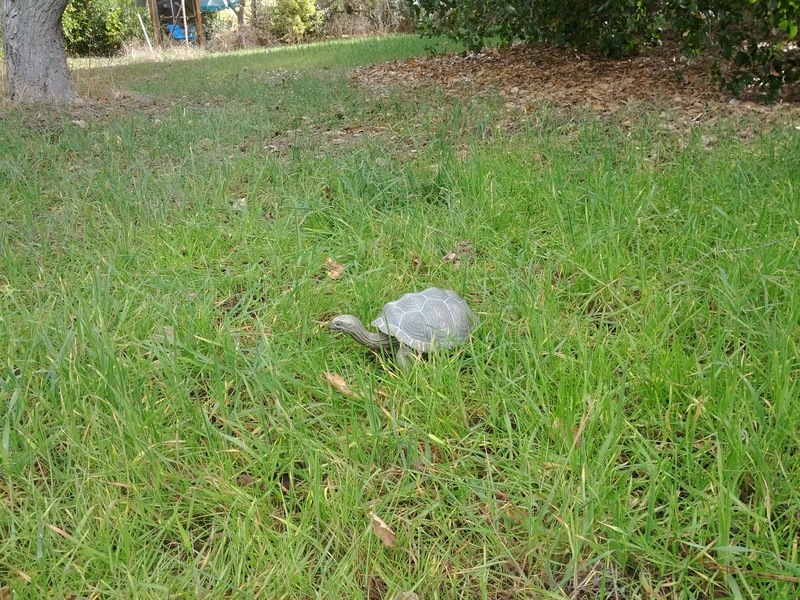 We've never seen a turtle in the "wild", so I'm not sure from where he gets this idea. Though we did rescue a box turtle off the streets of our neighborhood, right before it got nailed by a car. We named him "Logo", and he's now living in a turtle rescue haven. Since giving up his first turtle, my son occasionally whimpers, and when I ask him what's wrong, he often says he's sad because he misses Logo. So today, I'm in luck. 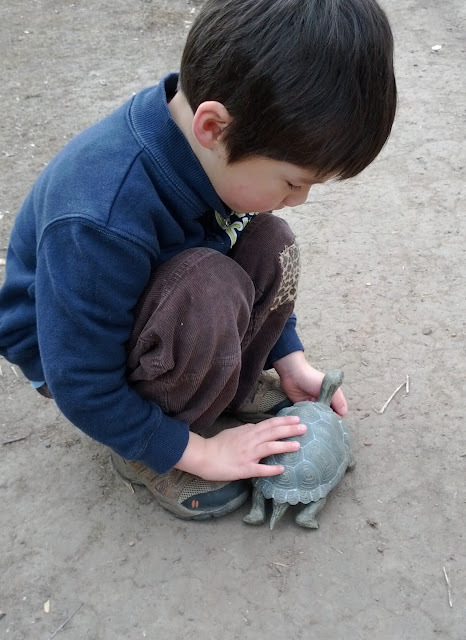 I bought a realistic-looking toy tortoise last year and have been saving it for just the right kind of surprise for my son. This is it! I quickly grab the turtle from its hiding place in my closet, wrap it up in a towel, and secretly stuff it in the diaper bag. I then scoop up the baby, inform my son his shoes are on the wrong feet, and we hop in the car with the dog and head to our favorite off-leash trail. Once my son realizes where we're going, I can hear him lose steam. We've been to this trail many times, and he's never seen a turtle, ergo...why in the world are we going here now for turtle spotting?! Indeed, he acts disappointed and mopey for most of the walk. I'm trying to encourage him to look for turtles, and he's dragging his heels, saying we'll never find a turtle here. I say, if you believe you can find a turtle, then there's a possibility you will! But if you don't believe, then you're right, you probably won't. I encourage him to run ahead and look under the trees. 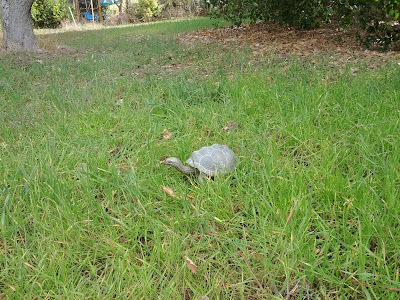 I use the opportunity while he's ahead to place the toy turtle on the ground (a bit more hidden than in the pic below). H comes back to me, clearly dejected and hopeless. He walks near the turtle and doesn't even notice it. So I remind him that if he doesn't look for a turtle, he won't find one. He whines that he's ready to go home. I ask him if he thinks whining will help him see a turtle if it were there. He doesn't answer. I lightly suggest that focusing on his emotions about his search might block his ability to see a turtle. In fact, he's walked right by it multiple times now. Finally, he rallies and searches one more time. Aha!! 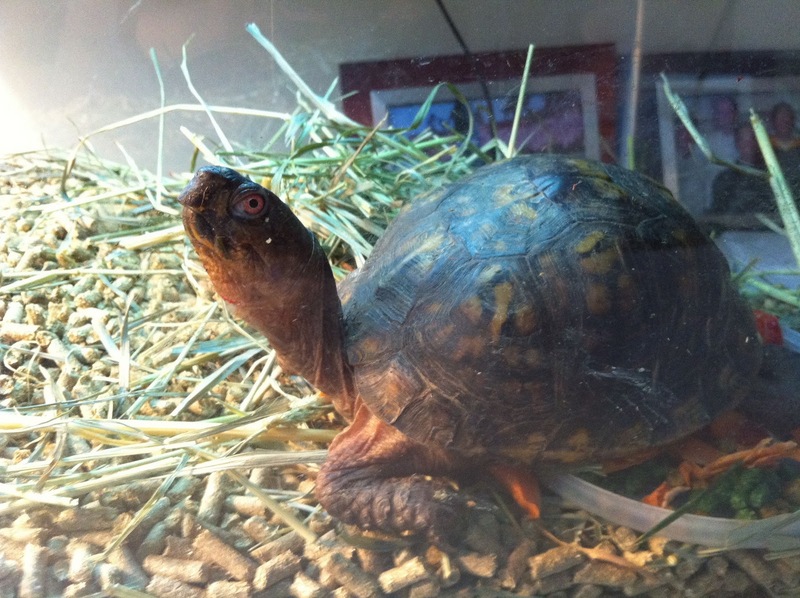 He runs to the turtle, his eyes twinkle with surprise. Even though he can readily tell the turtle isn't real, there's no disappointment. Only delight. For the rest of the day, he makes a home for the turtle, feeds him, names him (Logo, of course), and can't wait to show him to people who come over.